This month’s Reader Guild discussion was led by this lovely lady, whose book list and reviews are far more informative and influential than mine – mostly because she is a literary snob and and can write an interesting review of any book. She led our discussion like a proper school marm (think Anne Shirley, or perhaps one of her lovely, well-spoken colleagues), asking us first whether we’d been previously familiar with Willa Cather, sharing a few juicy tidbits from the author’s biography, and then presenting a few topics she’d like us to discuss. It was delightful, but you want to hear about the book, don’t you? 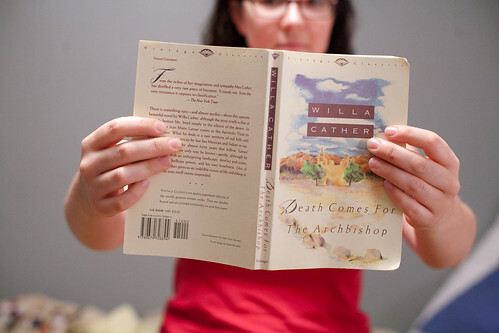 I would have never chosen this for myself – I usually avoid books with “death” in the title. However, it was a relaxing read. I was fond of the two main characters, and the sensational side stories about life in this wild country were highly entertaining. The tone of this book is very different from Cather’s other stories, I’m told, so I might check out a few of them for comparison. ← how do I get there from here?